IndonesiaTravelVisit.com | Located between Oya river surrounded by green rice field area, Sri Gethuk water fall flows without being influenced by the weather. It's thunderous sound seems breaking the silence in Gunungkidul that is well-known as a dry region. The exoticism of the Grand Canyon in the northern Arizona, the United States becomes something undeniable. It is a naturally formed cliff and steeply sloping mountainside which looks more amazing because of the Colorado river flow. The name of Grand Canyon is adapted for a natural tourism object in West Java, Green Canyon, to refer to a river flowing between valley. 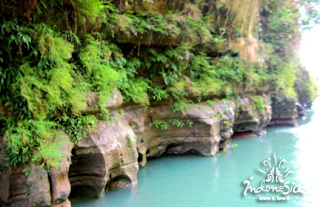 Assumed as a dry and barren region, Gunungkidul turns out having an almost similar natural object as the Grand Canyon. 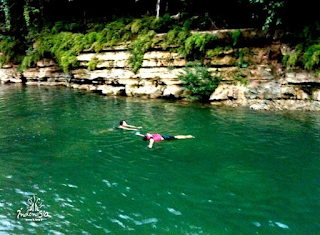 A never stop water fall flowing throughout the year gushes between gorge, and it is called Sri Gethuk. Located in a village called Bleberan, this water fall becomes a very worth visit spot. To get to this place, you need to ride your vehicle along the woods owned by the government. You have to be careful since the road condition is not always good in some parts. 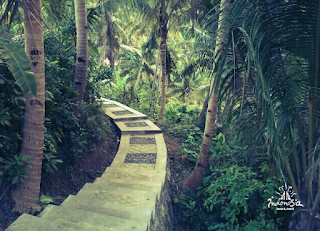 Entering Menggoran village, we will see different vegetation of wood, and it's a quite dense woods. 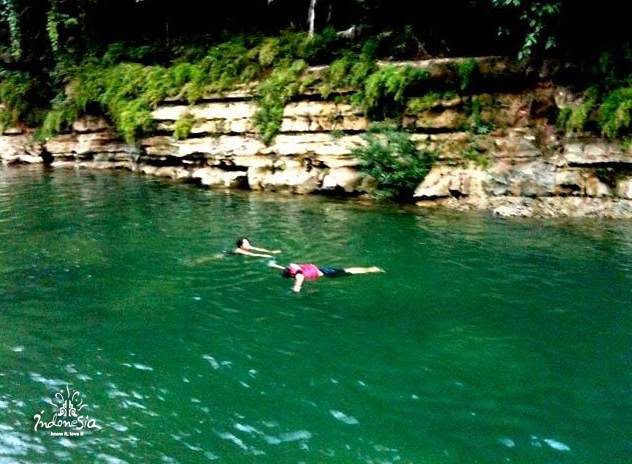 After getting to a fishing area which is also functioned as a parking lot, there will be two choices to reach the falls. The first track is going to a path with green rice fields and coconut trees as the view, and the second one is crossing the stream of Oya river using a very simple raft made of drum and wooden board. Certainly, at that time we chose the second choice. The trip to Sri Gethuk water fall began before noon when Oya river looked still and green and it looked so harmony with the karst valley on both sides of the river. The sound of our raft bending the stream broke the silence of the morning time. While riding the raft, a guide told a story about the history of the falls. 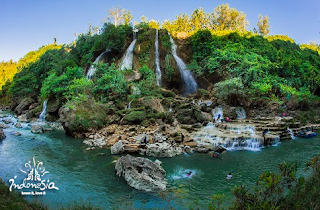 Based on the legend, the falls was used to keep kethuk (one of music instrument of gamelan, a Javanese music instrument) belonged to Anggo Meduro, who was a kind of genie. Sometimes, the people living near the falls still could hear the sound of the instrument and that was why it was later called Sri Gethuk. After riding the raft for some times, we could hear the thundering sound of the falls. Sri Gethuk water fall was in front of us and we could see beautiful stones below the falls forming terrace at the edge of a luxurious pool that invited everyone to swim. We got off from the raft and passed the stones to get to the falls. It felt like in an unknown world where water was everywhere. One of us suddenly shouted "Look! There's rainbow" and when we saw it, an awesome colorful curve was above us and at that time it made us felt like being fairies. 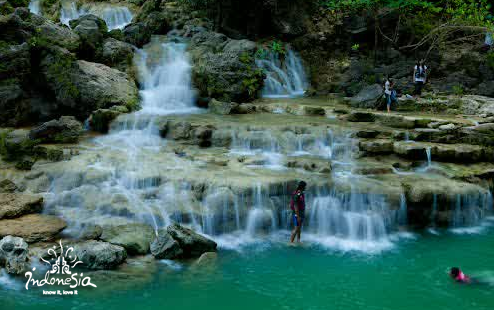 Notes: Sri Gethuk water fall is a tourism object that is fully organized by the local people of Bleberan village. For further information, you can contact Kohar (+62 853 3400 5700) and Tri Harjono (+62 813 2821 6842). 0 Komentar untuk "SRI GETHUK WATER FALL, Thunderous Sound in The Silence in Dry Region"